Giants Causeway is one of the natural wonders of Ireland. These unique rock formations were formed in the County Antrim on the northeast coast of the northern part of the country. This natural phenomenon is only about two miles north of the city, which makes the popular Bushmills. For tourists the walk and view of the distilling area is very attractive and a favorite activity. 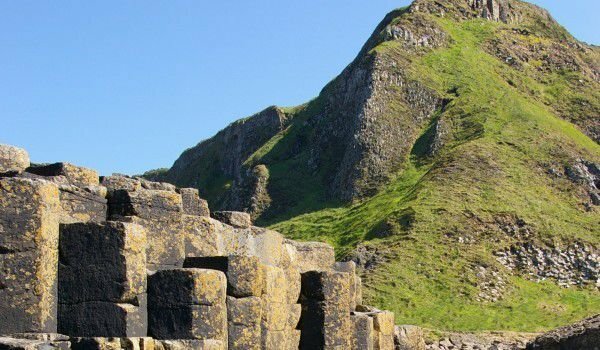 The most convenient way to get to the Giants Causeway is by car or bus from Belfast or Derry. The region of the giant trail is the only place in Northern Ireland, declared a monument of World Heritage in 1986 by UNESCO and a National Nature Reserve in 1987 by the Department of Environmental Protection in Northern Ireland. According to one giant radio presenter the path is chosen as miracle in the UK. This phenomenon Giants Causeway was formed 50-60 million years ago, during Paleogene as a result of several volcanic eruptions. Then the huge masses of hot basalt were thrown to the surface. As a result of cooling, it crushed about 37, 000 separate pieces of stone, which now account for this phenomenon. The columns and stone units occupy sections of the coastline, encompassing the sea. Today most of the tourists in the area go there to visit the caves that were formed between the stone blocks, which can be easily reached by boat. In the region there are numerous ruins of destroyed castles. One of them is Dunluce castle which was built in 13th century. It was built on a huge scale, which leads to a post, but remains below the formidable and powerful view of the marine abyss. In the east of the Giants Causeway is located Dunseverick castle, which is older than Dunluce. Shortly thereafter comes the dating of 14th century palace Kinbane. This area relates to some legends. One of them tells of a giant warrior named Finn Makkul who started to make an embankment into the sea until Stafa island in Scotland. The reason why the giant decided to tackle the daunting task was because of a beautiful girl, which he loved.